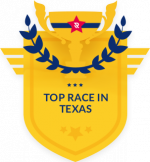 Texas Two Step Challenge | Complete both the ZOOMA Texas Lost Pines and Wine Country races (10k or longer) in the same year and earn the Texas Two Step Challenge medal! Sign up for our e-newsletter to get the most up-to-date info on 2019 ZOOMA Texas! RESERVE YOUR SIZE! Pre-order your ZOOMA Lost Pines merchandise today! We’ll have your pre-ordered merchandise waiting for you at Packet Pick Up! The ZOOMA Texas Lost Pines weekend events will start/finish near Downtown Bastrop, TX in Fisherman’s Park, 1200 Willow Street, Bastrop, TX 78602. Parking for Packet Pick Up is available free of charge at the Bastrop Convention Center. For race day parking, we recommend parking in one of the public parking lots near the Bastrop Public Library. From there, the start line area is a short walk (.2 miles) down Farm Street to Fisherman’s Park. Parking in the Bastrop public parking lots is available free of charge. Pick up your packet on Friday, March 8 from 12noon – 8pm at the Bastrop Convention Center located at 1408 Chestnut St, Bastrop, TX 78602. If you’re running the 5K on Friday evening please note that the Convention Center in approx .5 miles from the start line at Fisherman’s Park so please allow ample time to pick up your race packet and get to the start line. There is no race day packet pick up for the Half Marathon or 10K unless you purchase the Race Day Packet Pick up. Please pick up your packet on Friday or purchase the Race Day Packet Pick up option. Race day packet pick up can be purchased for $10. New Courses. Based on feedback from last year’s race, we’ve reworked our course and start and finish locations to keep all that you liked (gorgeous views of the Texas countryside) and changed up what you didn’t (huge hills) with a picture perfect finish in downtown Bastrop on the Colorado River. Plus you’ll still get to enjoy our famous ZOOMA post-race party with massages, mimosas, music and shopping! Lost Pines Challenge. If you’re looking for a challenge, run the new 5K on Friday evening and the Half or 10K on Saturday to complete the Lost Pines Challenge and receive the Inaugural Lost Pines Challenge medal! Friday Night 5K. You’re going to LOVE this new 5K course! Join us on Friday at 5pm for a family-friendly 5K loop with lovely views of historic Bastrop, TX. New Medals. Expect some incredibly fun, Texas themed medals for the 2019 ZOOMA Texas Lost Pines race! More Places to Stay. We’ve taken your feedback to heart and added a variety of different resorts that will fit every budget! We’re Running Texas Twice! We love the Lone Star state so much we’ve decided to run it twice. Join us in Fredericksburg, TX on November 1-2 for ZOOMA Texas Wine Country Half Marathon! Run both races and you’ll earn the ZOOMA Texas Two-Step Challenge medal. Bring your best friends, your sister, your mom or your daughter for a weekend you’ll remember for years to come! Recognized as one of The Top 10 Women’s Races by Shape Magazine, ZOOMA Texas Lost Pines is a race weekend you simply don’t want to miss! FRIDAY NIGHT FUN + 5K. Pick up your race packet and shop, hang out and have fun with your crew! Shake out those running legs and join us for the new Friday night 5K! RUN. Gorgeous runs through the heart of the Lost Pines in Bastrop, TX. Run a 5K, 10K or Half Marathon or combine the distances into our new Lost Pines Challenge! PARTY. Celebrate your Half Marathon and 10K run with an unbelievable Post-Race party including mimosas, food, massage, recovery yoga, music and tons of fun! Challengers will also receive a Lost Pines Challenge medal! Complete the Friday night 5K + Half Marathon or 10K to earn the Lost Pines Challenge medal! Want to register for the Texas Two Step Challenge? Just register for the ZOOMA Texas Wine Country Half Marathon, 10K or Wine Country Challenge and you’ll automatically be qualified for the Texas Two Step Challenge! We’re trying something a little different this year and offering a variety of resorts for you to stay at in the Bastrop/Lost Pines area. Please note that you’ll be responsible for your transportation to/from race day. Did you know Bastrop, TX is considered the most historic small town in Texas?! For information on what to do and see in this fun town, check out this video or visit www.VisitBastrop.com. The Hyatt Regency Lost Pines (the previous home of ZOOMA) is located at 575 Hyatt Lost Pines Rd, Lost Pines, TX 78612 – approximately 13 miles from the start line. Though we do not have a reserved block of rooms for ZOOMA at the Hyatt, they are offering us a very competitive rate when you book early using this link. And if you’re up for Glamping, check out the lakefront Airstream park at Lake Bastrop North Shore Park approx 7 miles from the start/finish line. We are proud to partner with Girls on the Run of Austin as our Official Charity Partner for ZOOMA Texas Lost Pines!